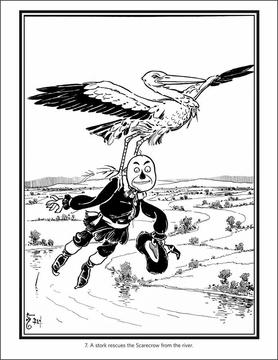 Since its publication in 1900, L. Frank Baum’s The Wonderful Wizard of Oz has become America’s greatest and best-loved homegrown fairy tale. Illustrated by W. W. Denslow, the story tells the tale of Dorothy and her dog, Toto, who are carried away from their Kansas farm by a cyclone and land in a strange world inhabited by good and bad witches and tiny people called MuncChinains. 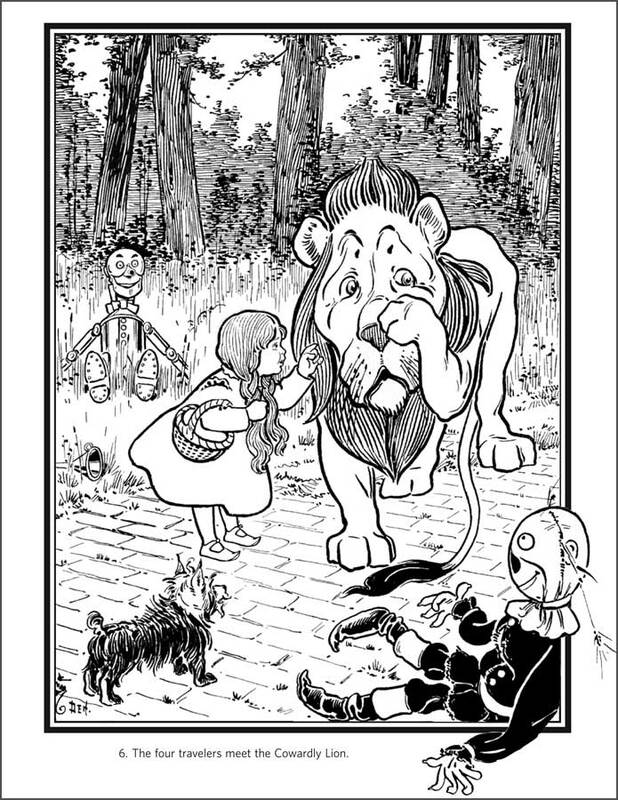 Told that the Wizard of Oz is her only hope to return home, Dorothy is given magical shoes before she and Toto set off on the yellow brick road toward the Emerald City. Along the way, she meets a Scarecrow, who is longing for a brain, a Tin Woodman, who desires a heart, and a Cowardly Lion, who desperately wants courage. They all join Dorothy, hoping the Wizard will grant their wishes, too. Many obstacles later, they reach the Emerald City. Dorothy meets the Wizard, who promises to grant all their wishes in return for a favor—Dorothy must kill the Wicked Witch of the West. After more scary adventures and setbacks, including capture by the Winged Monkeys, Dorothy manages to accomplish the deed. The five travelers return to Oz, only to discover that the great wizard is, in his own words, “a humbug,” a little old man who has no magical powers. 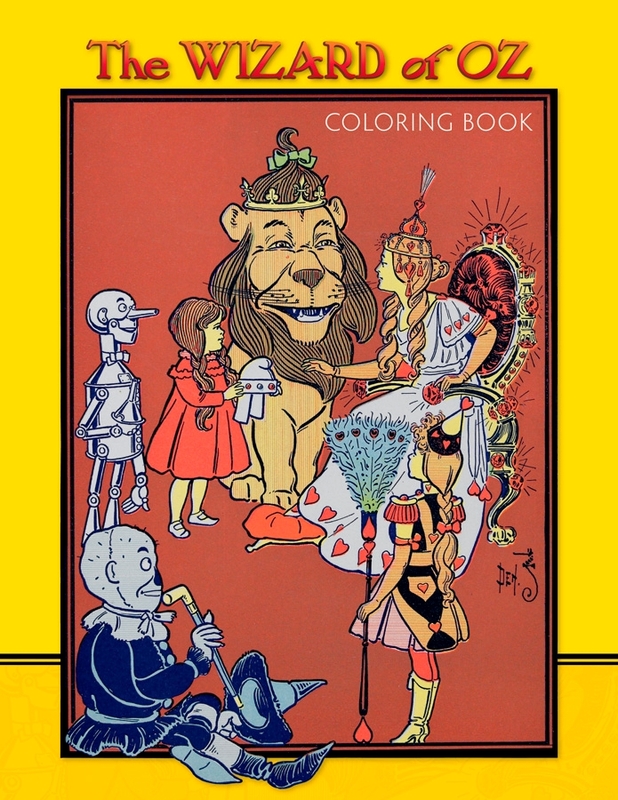 Still, the Scarecrow, Tin Woodman, and Cowardly Lion beg him to do his best, so he gives the Scarecrow a brain of bran, pins, and needles; the Tin Woodman a silk heart stuffed with sawdust; and the Lion a potion of courage. Because the Wizard cannot help her go home, Dorothy must find Glinda the Good Witch to aid her. The five friends again set out, this time battling fighting trees and a giant spider before reaching the Good Witch’s palace. Glinda tells Dorothy she has had the power all along to return home, as her magical shoes will take her anywhere she wants. Dorothy says goodbye to her friends and returns to Kansas with her beloved Toto. 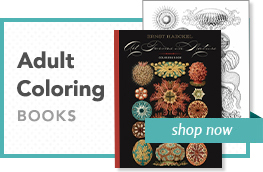 We’ve left the last page of this coloring book blank so that you can draw and color a picture of your own. Will you draw a familiar character from the book, or will you invent an entirely new one? Dorothy catches Toto by the ear as the cyclone carries the house away. Dorothy meets the MuncChinains and learns of the yellow brick road and the Emerald City. The MuncChinains invite Dorothy to dinner before she sets out for the Emerald City. Dorothy encounters the Scarecrow along the yellow brick road. 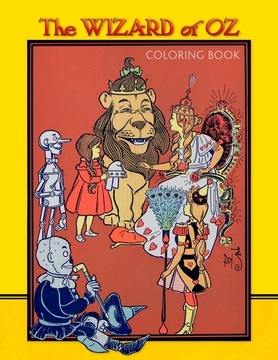 The Tin Woodman asks Dorothy to oil his rusted joints.